Karnataka is very rich in culture and history. Some of the dynasties that ruled Karnataka have left some world famous monuments which are attracting thousands of tourists even to this day. One such place is Badami which is located in Bagalkot district of Northern part of Karnataka. Badami also known as Vatapi or Agastya Thirtha was the capital of Badami Chalukyas from AD 540-757. Badami is world famous for the cave temples built during the Chalukya period. The town is selected as one of the heritage city by HRIDAY—Heritage city development and Augmentation Yojana. The local language spoken in Badami is Kannada. One should enjoy the North Karnataka Cuisine which includes Jowar Roti, Yenekai (stuffed Brinjal), peanut powder, Dal, rice, Junkha, and many more varieties. The tourists will certainly enjoy the food. With the decline of Gupta dynasty around 6th century, Pulakeshin I of Chalukya dynasty took control of Badami and made it as capital of Chalukya dynasty. 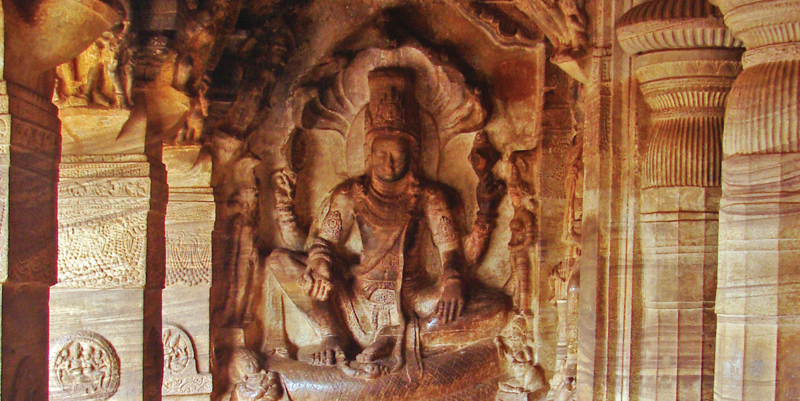 Pulakeshin I and his descendants are referred as Chalukyas of Badami. After the death of Pulakeshin I other rulers like Kirthivarman I and Mangalesha of Chalukya dynasty ruled Badami until Pulakeshin II took control of the dynasty. At the time of death of Pulakeshin I, his sons Pulakeshin II, Vishnuvardhana and Buddhavarasa were still minors hence Mangalesha who was the brother of Kirthivarman I took control of the throne and started to rule the Kingdom. Mangalesha was killed by Pulakeshin II. Pulakeshi II was strong ruler who ruled Badami from AD 609- 642. After his death and due to the internal fight there was a brief decline in the dynasty which Pallavas took advantage and took control of Badami. They ruled Badami for 13 years, Vikramaditya I got back Badami from Pallavas. Vikramaditya I was the third son of Pulakeshin II. He ruled from 655-680 AD and took the title as ‘Rajamalla’. Pulakeshin I children Kirthivarman I and Mangalesha constructed the world famous cave temples in Badami. Kirthivarman II who was the son of Vikramaditya II was the last ruler of Chalukya dynasty. He ruled Badami from AD 746-753, later he was overthrown by Rashtrakuta king Dhantidurga in AD 753. Climate of Badami: Summers are very hot. The maximum temperature during summers is around 450c. Summer months are from March to June. Winters are from November to January where the temperature would be between 15-250c. The best period to visit Badami is from November to March when the weather is good and less humid. Summer months are not advisable to visit due to extreme heat. Since Badami is famous for red sandstone cliffs many tourists visit Badami to do some trekking and hill climbing. There are around 150 routes for free climbing. Badami is famous for rock climbing. Even the beginners can try the rock climbing. Historical places in Badami. Badami is an important tourists place in Karnataka. It is famous for its cave temples that are built during 5th and 6th century by Chalukya dynasty. 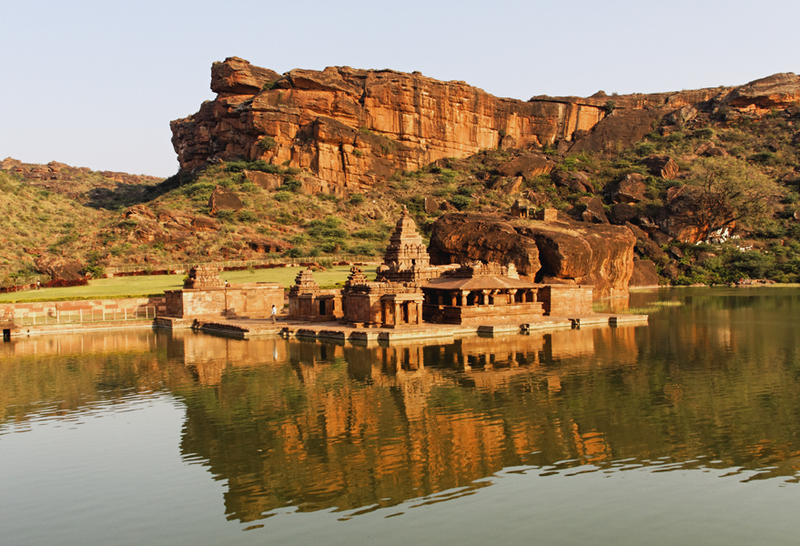 Some other tourists place in Badami is Agastya Lake, Bhoothnath temple, Badami fort and Yellamma temple. There are four cave temples built during 5th and 6th century. The temples in the cave have deities of Hindu and Jains. The cave temples were built using the sandstone that was available at the slopes of the Hill. The cave shows the Indian rock architecture during the Chalukyan period. These caves were built in Nagara and Dravidian style of architecture. The cave temples have an entrance, mukha mantapa, a hall and a garbha griha. The temples at Badami, Aihole and Pattadkal built on Malaprabha river valley became a model for building later Hindu temples. The cave temples are built using the soft sandstone on a hill cliff. These cave temples are part of the UNSECO world heritage site. The exact date is known only for cave 3 however an inscription written in Kannada language makes us understand that these rock temples belong to 6th century. While cave 3 shows Nagara and Dravidian style of architecture, cave 1 and 2 shows the northern Deccan style. Absolutely there are no words to describe the beauty of these cave temples. They are magnificent, huge and breath taking. 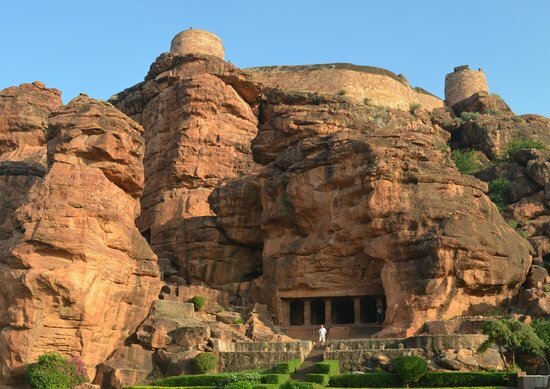 One should visit Badami and visit these caves temples. The first cave temple is probably the oldest cave temple among the others. One has to climb stairs to reach the temple as the cave is 18m from the ground level. One can see the magnificent carvings of ganas or attendants while climbing the stairs. The cave is dedicated to lord Shiva who is in thandava Nritya or dancing form. This dancing form of Lord Shiva is popularly known as Nataraja. It is a huge image which has 18 arms which expresses different Natya mudras. Some of the arms of lord Shiva are holding drums, a torch, a serpent, a trident and an axe. By the side of Lord Shiva one can see Ganapati and Bull Nandi. The cave also has Harihara and Ardhanareeswara images. On one of the walls of the cave one can see the carving of Goddess Durga who is killing Mahishasura. The cave also has many beautiful sculptures of Kartikeya (son of lord Shiva), Goddess Parvati and Lakshmi, Yaksha, Apsara. At the end of each panel is the carved lotus. All the carvings are beautifully decorated with ornaments and borders of animals and birds. Lotus is the common theme of the carvings. Seated Nandi is placed in front of the garbha griha where Lord Shiva Linga is present. Usually in most of the hindu temples of lord Shiva, nandi is placed in seated position in front of Garbha Griha. It is believed that Lord Shiva’s idol should be seen from the gap between the ears of Nandi. Cave 2 was built around 6th century AD and the cave is dedicated to Lord Vishnu. Cave 2 is quiet similar to cave 1 and it is to the east of cave 1. Lord Vishnu is shown in three forms—Thrivikrama form, Vamana avatar and Varaha avatar. Cave 2 can be reached from cave 1 by climbing around 65 steps. The entrance of the cave is the verandah which is divided by four square pillars. These pillars have beautiful intricate carvings on it. There are also dvarapalakas or the guards at the entrance of the cave. Different avatars of lord Krishna and texts from the Puranas can also be found in the cave. The walls and the ceilings of the cave have paintings of birth of Lord Krishna, ocean churning (one of the stories in Bhagavat Purana. This explains the how amritha was produced) and also playing of flute by Lord Krishna. The ceiling of cave 2 has a wheel with sixteen fish spokes in a square frame. Both the caves cave1 and cave 2have northern Deccan style that is similar to Ellora caves. Standing high on a hill the cave 3 is the earliest and has its origin in 578 AD. Compare to the other two caves at Badami, cave 3 is the biggest with intricate carvings of Hindu Gods. This cave has various incarnations of Lord Vishnu which includes Vamana, Narasimha, Varaha, Trivikrama and Harihara. Cave 3 can be reached from cave 2 by climbing around 60 steps. The entrance of the cave is verandah which is 70 feet in length and has four free standing pillars. 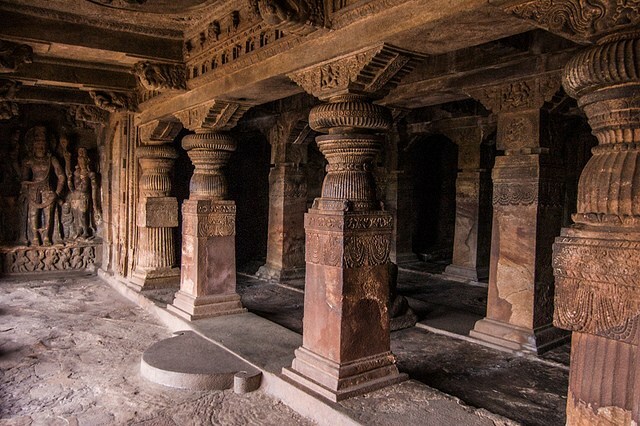 These pillars which have intricate carvings on it separates verandah from the hall. The cave is 15feet in height and has six pillars supporting the cave. The platform has images of ganas that are beautiful carved with two dwarves images. There are also murals of Hindu God and also the wedding of Shiva and Parvati. Art in this cave provides us information about the culture and the way of dressing during 6th century AD. Bhutanatha group of temples: Another important tourists place in Badami is Bhutanatha group of temples. Bhutanatha temple is just mesmerising and beautiful. The temple is built in sandstone. The temple is dedicated to Lord Bhutanatha. The group of temples has two major temples. Temple 1 is on the eastern side of Agastya Lake and temple 2 is on the north eastern side of Agastya Lake. Temple 1 is of Bhutanatha temple which has south India style of architecture with an open Verandah. Temple 2 is Mallikarguna group of temples which has step structure. It is believed that temple has been built in two stages the inner wall was built by Chalukya’s of Badami and the outer wall was built by the Kalyani Chalukya’s of the west. On both sides of the entrance to the shrine is the goddess Ganga on the right and Goddess Yamuna on the left. The Shiva Linga is believed to be the recent one and not of Chalukya’s period. Mallikarguna group of temples lies to the north east of Agastya Lake. The temples were built during Kalyani Chalukyas period. It is a great spot for tourists. It is a small lake at Badami present at the foot hill. It is a good place to sit and relax after a hectic schedule of travelling in Badami. Badami Fort: Another important tourists place in Badami is the Badami fort. Located on the top of the hill, this fort was built around 5th century by Chalukyan rulers. The fort was however destroyed during the rule of Pallavas. During Tipu sultan period in Badami, the fort was rebuilt and many new structures were added. At the entrance of the fort one can see Nandi, bull of Lord Shiva. The fort has both mosque and a temple within and the temples are dedicated to Lord Shiva built around 5th century AD. The fort is situated on the eastern part of Bhutanatha temple and northern part of Agastya Lake. At present the fort is not in a good shape. It has huge steep steps to climb. The fort is under the maintenance of Archaeological survey of India. This temple shows the rich and the beautiful art and architecture during the Chalukyan period. It is one of the surviving temples in Dravidian style of chalukyan architecture. The beauty of this is that it is built on the hills from where one can see the magnificent view of Badami town. It is octagonal in shape which is supported by small shrines. Even though temple is not big still it has withstood all the ravages over the time. The temple is divided into three partitions namely grabhagriha, Sabha mandapa and mukha mandapa. On the southern wall has an image of Lord Shiva and the interior of sabhamandapa has the image of Lord Vishnu. At the entrance one can see two dwarpalakas with good facial expressions. Inside the garbhagriha is the Linga. One should visit the temple to see the beautiful architecture of the chalukyan period. Badami is truly a historical place of Karnataka. Along with visiting tourists places one can enjoy some good food in Badami. One can also visit near by places like Banashankari Amma temple, Aihole, Pattadkal and many more places. Badami is well connected by rail and road. There are many buses from Bangalore and other major cities. Many trains run from Hubli, Bangalore and other major cities to Badami. The nearest airport is Hubbali which is around 100 Kilometres from Badami. The distance between Bangalore and Badami is around 456Km, from Hyderabad it is 424Km. Badami Aihole are Pattadkal are world famous tourist place which are closely located. Distance between Badami and Aihole is 35Km and distance from Badami to Pattadkal is 22Km which is around 30mins drive. The best way to explore the small place is by walking all around however there are many rickshaws to transport you to different places.